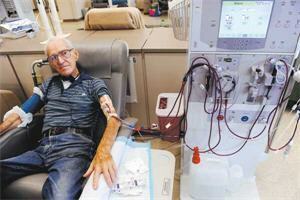 "With everything that is going on, you feel like you are becoming sort of a dialysis dollar," said Julie Estes, a 53-year- old Colorado Springs woman who spends three days a week, four hours at a time, hooked to a dialysis machine in order to stay alive. DaVita says it "paid millions" in 1998 to the doctors of Western Nephrology in Denver to retain them as medical directors of six dialysis centers in the metro area for 10 years. The doctors signed non-compete agreements, promising not to join forces with DaVita rivals or steal any of the California-based company's nurses. DaVita contends in its lawsuit that it found out about Western Nephrology's "secret campaign" because the dialysis company they were working with applied for Medicare billing numbers for five new centers in the Denver area. In its counterclaim, American Renal Associates accused DaVita of violating federal antitrust law — the company had controlled at least 80 percent of the Denver market. DaVita lagged in updating its dialysis centers until competition was imminent, according to court records. And the claim accused DaVita of "filing legal actions that are objectively baseless" merely as an "anticompetitive weapon." DaVita tried to stop the doctors' partnership with American Renal Associates with a court injunction, which was rejected. "There were numerous reasons we didn't want to continue our relationship with DaVita — one was that we didn't care for the way they cared for patients," said Dr. Michael Anger, one of the Western Nephrology physicians. The doctors say they wanted to stay on as medical directors of the DaVita centers as well as the new centers opened by American Renal. But DaVita wouldn't allow it. "If somebody has a monopoly, it's economically very advantageous to them," Anger said. "I think they are still trying to intimidate us." In its defense, DaVita — the largest dialysis company in the country, with 115,000 patients and 1,500 centers — says it has only an "incredibly small percentage" of doctors with contractual issues. "Here is the simple truth: These doctors are not living up to a contract they freely signed," said Chris Riopelle, DaVita vice president of corporate development. "We lived up to our end; they didn't live up to theirs." Colorado Springs kidney doctor Jesse Flaxenburg says his wife and daughters burst into tears the night he was served, at home, with a lawsuit from DaVita. The physician, who works for Pikes Peak Nephrology, is now mired in an ugly lawsuit and countersuit against DaVita. Ten-year non-compete agreements the doctors had signed with DaVita were expiring this month, and the doctors instead wanted to work with Liberty Dialysis. "I consider DaVita's tactics to be unethical attempts to intimidate me," said Flaxenburg, who never signed a non-compete agreement with DaVita. "I have no doubt they will end up losing or withdrawing these lawsuits." In their countersuit, filed in April, Pikes Peak doctors say DaVita's "cost-cutting measures and administrative bureaucracy" were taking precedence over patient care. The doctors say they were concerned about the centers' staff's overuse of the anti-anemia drug Epogen, plus poor wages and working conditions for nurses. Despite the opening of two Liberty dialysis clinics in Colorado Springs, DaVita said it has retained 90 percent of its patients in that city. DaVita says Pikes Peak nephrologists have tried to coerce patients to quit using DaVita. "Some patients are being pressured by their doctor to leave a place where they feel safe and loved," Riopelle said. Estes, who has been on dialysis for eight years, stayed with DaVita even though her doctor's office, Pikes Peak Nephrology, mentioned more than once that Liberty had opened a new clinic nearby. "I don't see me, at this point, changing clinics because of the new guy in town," she said. Estes suspects, though, the new competition spurred DaVita to bring in heated chairs and make the clinic a "warmer atmosphere." The competition for staff also is fierce. Former DaVita employees said that just before they found out Liberty was coming to town, they were asked to sign agreements promising they would not work for any competitor for at least six months after leaving DaVita. The agreements also spelled out "stay-put bonuses" of $11,000 in 2009 and $9,000 in 2010. DaVita since has sued Pueblo registered nurse Diane Odell, who quit DaVita in November to work for Liberty. DaVita also has sued kidney doctors in Reno, Nev.; Salt Lake City; and Pocatello, Idaho, among other places — all for aligning themselves with rival dialysis centers. When DaVita realized Pikes Peak Nephrology doctors — who have 325 of the 370 patients on dialysis in Colorado Springs — were about to partner with Liberty, DaVita chief executive Kent Thiry desperately tried to keep them. The company keeps tabs on newly trained nephrologists and tries to scoop them up before the competition. The company has entered agreements with 178 new doctors in the past year and a half alone. DaVita was nearly bankrupt when Thiry took over in 1999, company executives said. "He built a great team, and they turned the company around," Riopelle said, adding that employees — called teammates — were allowed to pick the new company name, which means "giver of life" in Italian. Riopelle said DaVita is focused on patient care and would rather tout its "superior clinical outcomes" than the size of the televisions in its clinics. He brushed off accusations that the company is moving from El Segundo, Calif., to Denver to give itself a public-relations boost in Colorado. "We moved our headquarters to Colorado because we believe it is a great place for our business, our teammates and their families to grow," Riopelle said.